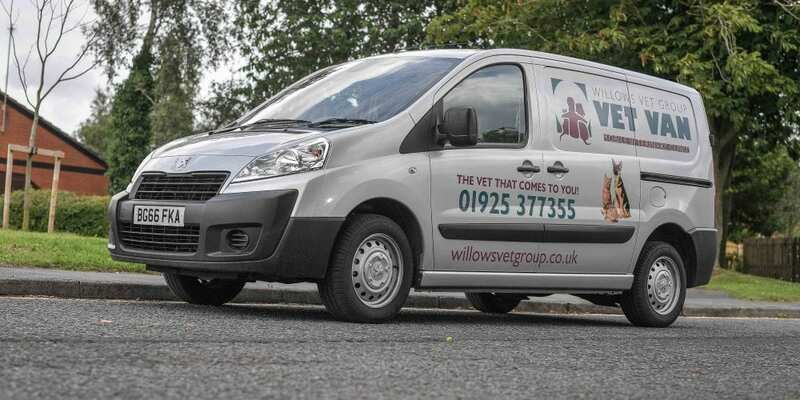 Find out all about our Vet Van service. The vet that comes to you. We recognise that some of our clients find it difficult to bring their pets to one of our surgeries. So that we can provide an affordable at-home option for our clients we have launched the new Vet Van. The Vet Van will visit different areas in Warrington, Runcorn and Lymm on specific days, visiting each area at least every four weeks. When the clinic is in your area you will be able to arrange a home visit for your pet for only £25. If you have multiple pets in your household the call out fee will still only be £25. Other fees such as consultation fees and treatment fees, will be charged on top of this fee, however, will be exactly the same as those charged in branch. The Vet Van will be linked to our main surgeries with instant access to patient records and can also take card payments for your convenience. On scheduled days, the Vet Van will be in the designated area from 10 am to 2 pm. When making your booking with the mobile clinic we will ask that you keep these hours available for the visit. On the morning of your appointment, one of our nurses will call to give you a more accurate time slot. You will also receive a text message or phone call when the van is on its way to your home. The Vet Van may not always be the best course of treatment for your pet, especially in an emergency or where specialist hospital treatment is required. If this is the case, alternative arrangements can be made to accommodate your circumstances*. To find out more or to arrange an appointment for the Vet Van please call 01925 377355 9am-5pm.